The following is from pages 669-674 of the Warren Commission Report. In August 1929, while . . . working at the law firm, Marguerite married Edward John Pic, Jr.,10 a quiet man of her own age, who worked as a clerk for T. Smith & Son. a New Orleans stevedoring company. The marriage was not a success, and by the summer of 1931 she and Pic were separated. Marguerite was then 3 months pregnant; she told her family that Pic did not want any children and refused to support her. Pic ascribed the separation simply to their inability to get along together. A boy was born on January 17, 1932, whom Marguerite named John Edward Pic. Pic saw his son occasionally until he was about 1 year old; after that, he did not see the boy again but contributed to his support until he was 18 years old. During her separation from her first husband, Marguerite saw a great deal of Robert Edward Lee Oswald, an insurance premium collector, who also was married but was separated from his wife. In 1933, Marguerite was divorced from Pic and, Oswald's wife also having obtained a divorce, they were married in a Lutheran church on July 20. Marguerite has described the period of her marriage to Oswald as "the only happy part" of her life. A son was born on April 7, 1934, who was named for his father; Oswald wanted to adopt John Pic, but his mother objected on the ground that John's father might cut off the support payments. In 1938, the Oswalds purchased a new house on Alvar Street for $3,900,26 in what John remembered as "a rather nice neighborhood." The house was across the street from the William Frantz School, which first John and later both he and Robert, Jr., attended. On August 19, 1939, little more than a year after the Oswalds bought the Alvar Street house, Robert Oswald died suddenly of a heart attack. Two months later, on October 18, 1939, a second son was born. He was named Lee after his father; Harvey was his paternal grandmother's maiden name. In July 1943, Mrs. Oswald was hired to manage a small hosiery store. This is probably the store to which she referred in her testimony as the "Princess Hosiery Shop on Canal Street," at which, she testified, she was left by herself and "in 6 days' time * * * hired four girls." Her employer remembers her as a neat, attractive, and hardworking woman, an aggressive person who would make a good manager. She was not good with figures, however, and after several months he discharged her. At about this same time, she met Edwin A. Ekdahl, an electrical engineer older than herself, who was originally from Boston but was then working in the area. They saw each other often. Ekdahl met the boys and, according to John's testimony, on at least one occasion, they all spent a weekend at a summer resort area in Covington, La. 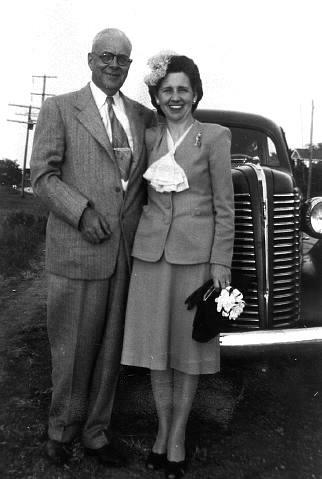 Marguerite Oswald with husband Edwin A. Ekdahl. The failure of their marriage deprived Lee Oswald of a father figure. By January 1944, Mrs. Oswald and Ekdahl had decided to marry. She withdrew Lee from the Children's Home and moved with him to Dallas, where Ekdahl expected to be located. They planned to postpone the marriage until the end of the school year so that the older boys could complete the year at the home before they left it. In the meantime, she would care for Ekdahl, who was recovering from a serious illness, probably a heart attack. Mrs. Oswald has testified that when she arrived in Dallas, she decided that she did not want to marry Ekdahl after all. Using part of the proceeds from the sale of the Alvar Street house, she purchased a house at 4801 Victor Street, a portion of which she rented. In June, John and Robert left the Children's Home and joined their mother in Dallas. They entered the nearby Davy Crockett Elementary School the following September. Ekdahl visited Mrs. Oswald on weekends and stayed at Victor Street. By the following year she had resolved her doubts about marrying him, influenced in part by his substantial income and perhaps by the visit some time earlier of his sister, who favored the marriage because of his ill health. Explaining that she expected to travel a great deal, Mrs. Oswald tried unsuccessfully to return the older boys to the home in February 1945. She and Ekdahl were married in May. After a brief honeymoon, they returned to Victor Street. Ekdahl got along well with the boys, on whom he lavished much attention. John testified that Ekdahl treated them as if they were his own children and that Lee seemed to find in Ekdahl "the father he never had"; John recalled that on one occasion he told Lee that Ekdahl and his mother had become reconciled after a separation, and that "this seemed to really elate Lee, this made him really happy that they were getting back together." Because Ekdahl's business required him to make frequent trips, in September, John and Robert were placed in the Chamberlain-Hunt Military Academy at Port Gibson, Miss. ; their mother paid the tuition herself, using the proceeds from the sale of the Alvar Street property. They remained at the academy for the next 3 years, returning home only for or vacations. Lee accompanied his parents on their travels. Mrs. Myrtle Evans, who had known both Marguerite and Ekdahl before their marriage, testified that Marguerite insisted on keeping Lee with her; Mrs. Evans thought that Marguerite was "too close" to Lee and "spoiled him to death," which hurt her marriage to Ekdahl. Sometime in the fall after John and Robert were at boarding school, the Ekdahls moved to Benbrook, a suburb of Fort Worth, where they lived on Granbury Road, in a house of stone or brick, set on a large plot of land. Records of the Benbrook Common School show Lee's admission into the first grade on October 31; his birth date is incorrectly given as July 9, 1939, his mother presumably having given that date to satisfy the age requirement. . . . The Ekdahls' marriage quickly broke down. Before they had been married a year, Marguerite suspected Ekdahl of infidelity. She thought him stingy, and there were frequent arguments about his insistence that she account for her expenditures and his refusal to share his money with her. In the summer of 1946, she left Ekdahl, picked up John and Robert at Chamberlain-Hunt, and moved with the boys to Covington, La., where they lived for at least part of the time at 311 Vermont Street. Mrs. Evans described them at Covington, possibly during this summer, as "really a happy family"; Lee seemed like a normal boy but "kept to himself" and seemed not "to want to be with any other children." The separation continued after the two boys returned to boarding school, and in September Lee was enrolled in the Covington Elementary School. His record at Benbrook had been satisfactory he was present on 82 school days and absent on 15, and received all A's and B's -- but he had not completed the work of the first grade, in which he was enrolled for a second time. Lee received no grades at the Covington School, from which he was withdrawn on January 23, 1947, because his parents, now reconciled, were moving to Fort Worth, where they lived at 1505 Eighth Avenue. Four days later, he enrolled in the Clayton Public School; he was still in the first grade, which he completed in May with B's in every subject except physical education and health, in which he received A's. In the fall, he entered the second grade in the same school but, relations between his parents having deteriorated again, was withdrawn before any grades were recorded. After the move to Fort Worth, the Ekdahls continued to argue frequently; according to John, "they would have a fight about every other day and he would leave and come back." That summer, Marguerite obtained what she regarded as proof that Ekdahl was having some sort of affair. According to her testimony, a neighbor told her that Ekdahl had been living on Eighth Avenue with another woman while she was in Covington. Then, at a time when Ekdahl was supposed to be out of town, she went with John and several of his friends to an apartment in Fort Worth; one of the boys posed as a telegram carrier, and when the door opened she pushed her way into the apartment and found Ekdahl in his shirt sleeves in the company of a woman in a negligee. Despite this apparent confirmation of her suspicions, Marguerite continued to live with Ekdahl until January 1948. In January, according to Ekdahl's allegations in the subsequent divorce proceedings, she "directed * * * [him] to leave the home immediately and never to return," which he did. Ekdahl filed suit for divorce in March. The complaint alleged that Marguerite constantly nagged Ekdahl and argued "with reference to money matters," accused him of infidelity, threw things at him, and finally ordered him out of the house; that these acts were unprovoked by Ekdahl's conduct toward her; that her acts endangered his already impaired health; and that her "excesses, harsh and cruel treatment and outrages" toward him made it impossible for them to live together. She denied all these allegations. After a trial, at which John testified and, he thought, Lee was called to the stand but was excused without testifying, the jury found on special issues that Marguerite was "guilty of excesses, cruel treatment, or outrages" unprovoked by Ekdahl's conduct. June 24, the court granted the divorce and approved an agreement between the parties disposing of their property between them and awarding Marguerite $1,500; at her request, the divorce restored to Marguerite her former name, Marguerite C. Oswald. The main Lee Harvey Oswald page. The "Oswald Timeline" showing the schools he attended and residences where he lived as a child and youth. The theory that there were two Lee Oswalds. Photos of Lee Oswald and family members. Lies Lee Oswald told as an adult. Oswald's assassination attempt against right-wing activist, Gen. Edwin A. Walker.